Many people who have eyesight problems that can be corrected by a simple procedure are now travelling abroad to get first class treatment at a lower price than is available in the UK. Long waiting lists on the NHS and the prohibitive costs of private treatments are the two main reasons that 55,000 patients a year go abroad for some form of surgery. Of the 55,000 patients who travel abroad every year, 9000 do so for treatments that can be performed by the NHS. Eyesight surgery abroad is very popular due to the fact that the treatment can be performed in one day and then the recuperation time can be spent by relaxing on holiday. There are many countries in Europe and farther abroad that provide eyesight surgery. Bear in mind that most of the surgical treatments can be performed within a day, surgery time is usually around four hours and then you are free to leave. Countries such as Spain, Belgium, Hungary and France have some of the most high tech surgical clinics that are comparative, if not better than those available in the UK. These clinics and hospitals use the most sophisticated laser and secondary lens implant technology available. At the moment Turkey has the largest ophthalmology hospital in the world. Bear in mind that you should also figure in the cost of flights and accommodation when calculating the cost of going abroad for eyesight surgery. Financially, it may be wise to stick to countries in Europe that benefit from frequent low cost flights. Flying time will also be cut by travelling to European countries rather than countries such as South Africa or India. Basically any type of eyesight surgery that can be performed in the UK can be performed abroad. 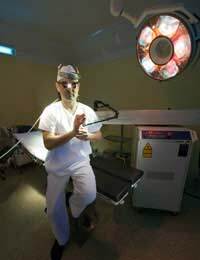 Surgical and non-surgical procedures are available using the most advanced technology including the latest developments in laser eye surgery. Always check the accreditations of the clinics and the qualifications of the surgeons. Make sure that the qualifications are certified by the country of the surgeon, or check that they have been registered by an ophthalmic association. Medical surgery abroad is an ever growing business, and the amount of providers has grown as a reflection of this. Many reputable providers can be found by using the Internet. They will be able to arrange accommodation, flights and advise on the best eye surgery options available to you. Always check the guarantees that the providers give; many will arrange for accommodation, flights and additional treatment at their own cost if anything does goes wrong and a return visit to the clinic abroad is required. Glaucoma is a condition where damage has occurred to the optic nerve at the back of the eye. Irregular loss of vision will be the main symptom and the process is permanent. If the condition is detected early enough the vision loss can be minimised and preventative measures can be taken. A number of different tests can be performed to ascertain that you are a suitable candidate for treatment. Cataract problems can occur at any age and can be caused by the natural ageing process but can also be caused by diseases such as glaucoma or diabetes. It can also occur due to the use of certain medications including steroid use. Symptoms can include blurred vision, double vision and poor night vision. Cataract treatment can only be performed with surgical incision, and there are no non-surgical treatments available at present. These can be either the replacement of the eye’s natural lens or a PHAKIC contact lens implant, where the eye’s natural lens is retained. Both these procedures are used to correct a wide range of eyesight problems including short or long-sightedness, myopia or to eliminate the need to wear glasses or contacts. The original laser corrective procedure that has been used for the treatment of eye problems in thousands of people for over two decades. The treatment involves the removable of the thin, protective layer of the cornea in order to reshape and refocus the cornea. Recovery time is around a week and results will be seen immediately. You will need to sit a suitability test but the results after the operation have amazed people at their new clarity of vision. As well as the surgical procedures there are some non-surgical eyesight treatments for conditions such as muscle spasms and squint problems. A common non-surgical treatment for conditions such as eye spasms involves the uses of Botulinum toxin injections, more commonly known as Botox® injections. With all eyesight surgery abroad you should have many pre-surgery consultations with the clinic of your choice. Ask as many questions as you wish until you are fully satisfied with your treatment choice. Ask questions about aftercare and the success rates of your chosen clinic. If you have undertaken your research thoroughly before hand you should have a very positive and successful experience.